I was scratching my head earlier today at the fact that 14 of the net 15 increase in U.S. rig count came in gas rigs and none of that came from the much talked about Haynesville Shale or Marcellus/Appalachian region. The main cause of head scratching is that the rise in gas-targeted rigs comes at a time when gas commodity prices have sunk to an uncomfortably low level. So I looked a little deeper. Over the past three months, the U.S. gas rig count has increased by 140 rigs, or 17%, while the spot price of natural gas has dropped 27%. 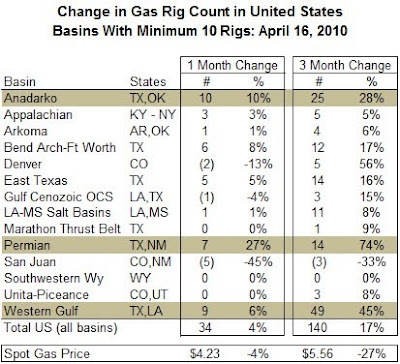 I found that the regions that had the highest levels of growth in gas-targeted rigs in both number and percentage were the Anadarko Basin (TX and OK), Permian Basin (TX, NM) and the sprawling Western Gulf, which stretches from the Eagle Ford Shale in SW Texas to southern Louisiana. 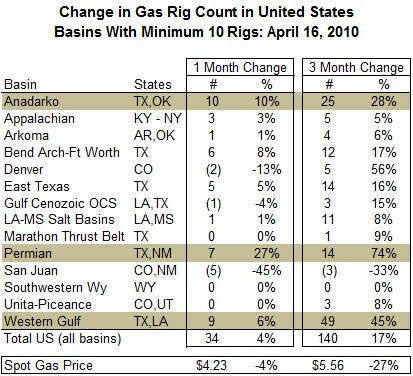 Those three basins represented 63% of the rig count growth since mid-January, as shown on the table below. Those of us who follow the Haynesville Play closely have watched cautiously over the past year as the Haynesville rig counts continued to rise ahead of national trends. Growth over the past three months has also been strong, led by east Texas additions, but over the past couple of weeks growth has stalled. A few operators have added rigs, but two of the largest drillers, Chesapeake and Petrohawk, have declared that they are cutting gas rigs. That impact is starting to be seen, and it is more pronounced on the Louisiana side of the play. The table below shows growth in Haynesville rig count over the same period as the table above. Good, but it wouldn't rank in the top three. I've been pleased to see stories in the national media this week suggesting that the economic recovery might be stronger than expected. That is very good news. But will it be enough to put some support under natural gas prices through the end of the year? The question I'm eager to see answered over the next month or two is, has the Haynesville Shale rig count topped out for 2010? Robert, my guess is that we will see a plateau in the Haynesville rig count, at least for the next six months or so. Since Chesapeake and Petrohawk have both announced that they plan to increase their focus on oil until gas prices recover, and since Petrohawk's Eagle Ford acreage has the added benefit of condensate, it makes sense to put out in the Haynesville the minimum number of rigs you need to hold the acreage, until prices improve. But, really, isn't this the market correcting itself? Of course, my opinion is worth about what you're paying for it!